A picture is called perfect only when all its features and textures get properly enhanced and showcased as if it is in the natural state to get an amazing range of dynamic photos, it is primarily necessary to have the right amount of light exposure. Too much or too little of light can actually ruin the clarity of the picture even with the most hi-tech cameras. However, practically speaking, waiting for that appropriate moment to click an image is not possible. Therefore, this leads to the advent of our real estate HDR photo editing services. The basic task of our image enhancing experts is to bring the best combination of different images with variant shades of contrast and brightness. It eventually brings out a well- lit and clear picture which can allure and attract just anyone. As the best HDR real estate photo editing company, we have a well -trained team supported with appropriate software programs to make HDR photo blending come true in the most enticing manner. Using our HDR image processing services, we can edit the pictures of real estate properties that lead to a sharp and clear photo without flaws, which is capable enough to give out all necessary details. At MAP Systems, we use the latest and most advanced image editing software so as to bring out the high resolution and supreme quality images which are compatible in different formats like RAW, PSG, JPEG, etc. Our HDR photo blending services are the answer to all your concerns. The blending of various images leads to the provision of more depth and a high level of sharpness which creates a lasting impact on the viewer. Maintaining the original quality of the images and yet wrapping them up to give an awesome look to the property is what we aim here at MAP Systems. To create appealing HDR images that attract customers, we provide the right merging and blending of images with different exposures. For example, to capture highlights, we use normal and under-exposure shots whereas for capturing shadows, we include over-exposure shots. We can offer 360-degree virtual tour for our potential clients to provide a real-life experience for virtually visiting the property. We got the right combination of technology and people who create exceptional virtual tours for all kinds of properties. We use the technique of combining multiple photographs of the real estate properties from different angles to produce a 360-degree panoramic view of the images. It allows prospective buyers to rotate the products or images to get a detailed view of the property. Through real estate image retouching services, we can enhance the features of your residential and commercial properties to attract various prospects. Thus, it will increase the visibility of the property and generate sales. We offer great quality white balance adjustment with the help of our photography post-processing services. Unwanted white colors create a gloomy and unrealistic feel to the whole image. Our photo editing experts scrutinize the presence of such issues and tactically do the needed white balance adjustments on the objects to elevate the overall exquisiteness of the image. If your images have noise related issues, we can help in fixing them immediately and immaculately through our creative HDR picture editing services. Let it be any of your treasured memories captured or real estate image captured, our image processing and retouching retouching experts can work to make the needful cleaning and corrections. We are specialized in retaining window details. 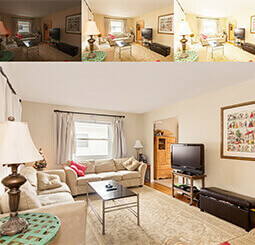 Through proven real estate photography blending technique, and real estate retouching services, we make three completely different images overlap with lower and higher exposure results from a single highly qualified image. Our experts retain and do the needed enhancing to make the window details enticing and noteworthy. You can confidently outsource HDR photo enhancement services to us. Background replacement is crucial many times as we add, remove or edit the background with the purpose of increasing the class of your images in all ways possible. By making use of the advanced software and editing tools, we make sure that the newly done background complements the quality of all elements present on the image foreground. Shadows and highlights are critical in providing a realistic feel to your images. Merely snapping using a camera never provides perfect images with the right range of tones that appeal to human eyes. Our experts manually do the needed shadow/highlight adjustment in Photoshop to make sure that the images look exactly what it takes to fetch you results. Vertical or horizontal distortions in images can make them appear unprofessional. This happens when you snap using low-quality cameras. Our image editors can correct all perspective inconsistencies on the portraits to make your images look refined, presentable, and professional. Real estate perspective correction services provision is one of our main fortes. In some images, colors appear unnatural; there are snaps that have predominantly yellow or blue hues. Inadequate lighting or unfavorable weather conditions are the main reasons for this issue. With our color adjustment in Photoshop, we remove the color casts and make the image appear brighter, life-like and attractive with our color cast removal services. Read our real estate HDR photo editing case study to know how we helped to create 360 degree virtual touring and photography services for US-based Company. There are many reasons why you will not regret using our expert editing and blending facility. We, at MAP Systems, guarantee to provide to you the best real estate photo editing and manipulation services. The efforts we take in real estate image editing are of professional quality and is great on the accuracy front. Our team assures offering high-quality pictures that can be layered and merged seamlessly, to exhibit flawless images. We have a team of skillfully trained experts who are compatible with the latest HDR photo editing software and techniques to produce exceptional output. Time matters us more than anything else. So, we ensure that the task completion time is minimal which an additional advantage is for our clients. We are focused on providing positive customer experience by meeting all their expectations to gain satisfaction and loyalty. With the help of different HDR mapping and blending services, we offer customized solutions regarding real estate photo editing needs to deliver world-class image blending outputs. Finally, our services will provide the necessary help to finalize the deal with the customers. You will surely be amazed and thrilled with the quality of real estate HDR image editing services we provide. To know more about the various packages that we offer, contact us today.